Community service and social justice have always been a vital part of Alec Golini’s life. His efforts to support Easton residents living in poverty have been recognized by Campus Compact, a national coalition of more than 1,100 college and university presidents promoting campus-initiated civic engagement. Deja Washington ’14, Brandon Turner ’14, Alec Golini ’14, professor Deborah Byrd, and Fredy Flores ’14 discuss their work with the Easton Area Neighborhood Center. Golini ’14 received the coalition’s Newman Civic Fellows Award, which honors student leaders who, through service, research, and advocacy, are finding solutions for challenges facing communities throughout the country. 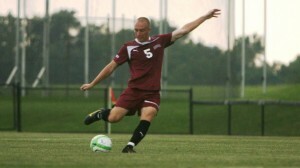 A government and law graduate and member of the men’s soccer team, Golini founded Athletes C.A.R.E. (Creating Abundant Relief Effort) in 2012. The nonprofit engages athletes and young people in community service projects that better the lives of the poor, hungry, and homeless. The organization now has branches on three other campuses and has raised more than $30,000 for local agencies that provide housing, food, case management services, and rent and utilities assistance. It also hosts free youth soccer and basketball clinics in which participants donate a canned good to local shelters. The success of Athletes C.A.R.E. 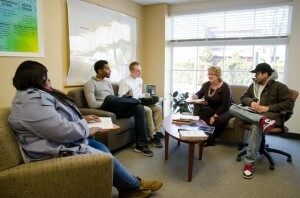 led Golini to team with Deborah Byrd, professor of English and a member of Easton Area Neighborhood Center’s Board of Directors. Together with Fredy Flores ’14, Brandon Turner ’14, and Deja Washington ’14, they produced “A Roofover Our Heads,” a documentary featuring residents of the center’s Roofover homeless shelter, and a photo narrative book about the center’s ASPIRE mentoring and support program for pregnant and parenting teens. On April 24, Golini and other members of Athletes C.A.R.E will present a $3,200 check to Roofover from a recent fundraiser. A three-year member of Lafayette’s Oaks Leadership Academy, Golini was chosen to attend the Naval Academy Leadership Conference in 2013 and was the recipient of the Patriot League Outstanding Leadership and Character Award in 2012. He is now a records analyst at the Ropes & Gray LLP law firm in Boston and plans to become a civil rights lawyer. Categorized in: Academic News, Alumni, Community-Based Learning and Research, Government and Law, News and Features, Students, The Real Deal: Real Students. Real Athletes. Alec Golini ~ Congratulations, great job!